Automated identification of mother reels with RFID pushes intralogistics in tissue industry to a new level. 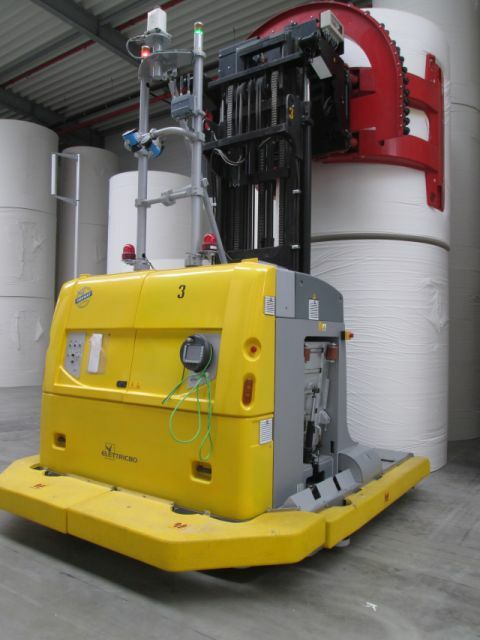 "People-free intralogistics process requires a reliable and automated identification of the mother reels from any direction"
On its site in Mainz WEPA decided to automate the intralogistics process of mother reels with automated guided vehicles (AGV) from Elettric80 Spa, which are managing a floor warehouse. Mother reels produced by the paper machine are transported and stored into the warehouse by AGV. The converting process where mother reels are processed into to end products is as well supplied with mother reels by AGVs. Since there are no persons involved in the intralogistics process the reliable and automated identification of the mother reels is crucial. Reels must be identifiable reliably from any direction by the AGV system and the converting machines for logistics automation and production traceability. The identification process is based on Vilant Systems RFID readers and software combined with Sonoco Alcore’s Intellicore UHF RFID equipped paper cores. When the paper is produced on the core, the reel identification number and parameters are programmed into the RFID transponder of the tissue reel core by the paper machine. The AGV process and conversion machines can then automatically identify the reel with RFID readers, which identify the reel ID though the paper in the process points. In tissue manufacturing the cores are reused after the paper has been consumed by the converting machines. The RFID tag integrated into the core is a cost efficient identification solution since it can be reused as long as the core is functional for reuse. The RFID readpoints are controlled with Vilant Engine software, and the entire process managed by Vilant Visibility Manager Server (VVM). VVM is also used for integration of RFID process information into back end systems like the AGV WMS and ERP. Vilant RFID middleware, which enables a real time process visibility and integration for all paper reel movements in the intralogistics process. WEPA is a German family owned manufacturer of hygiene papers founded in 1948. With a turnover of approximately 1 billion € and 22 paper machines in Europe it is one of the three leading hygiene paper product manufacturers in Europe. Thanks to consistent expansion and investments amounting to millions of Euros, all WEPA locations are state-of-the-art and produce contemporary hygiene paper products for the most varied consumer requirements.